Edinburgh: Knox Press, 1995. . 105 pages.. First Edition. Paperback. Good Plus. 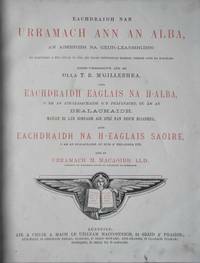 Glasgow: Alasdair MacLabhruinn 's a Mhic, 1946. . 352 pages, 24 sermons in Scottish Gaelic.. Second Edition. Cloth. Average. London: William MacKenzie, 1875. . 532 pages. Scottish Gaelic edition of the Scots Worthies. Leather spine torn and partially detached from front cover. Inscribed "To John Macleod from Ina Macmillan" and "To Mr & Mrs John Morrison and John Morrison Junr from John Macleod, and it is my wish that this book will not be given away to anyone, as it was of sentimental value to the Macmillans & Macleod while in their possession. J McL. 22nd March 1954".. Half-Leather. Average Minus. 4to - over 9¾" - 12" tall.